Q. Can I convert my favorite conventional recipes for use in a pressure cooker? Q. Can cooking liquids other than water be used in a pressure cooker? Q. Will flavors blend together if I cook several foods at the same time in the pressure cooker? Q. Can I use my pressure cooker on all types of ranges? Q. What do I do if the food is not completely done after the recommended cooking time? Q. Is it necessary to brown meat and poultry before pressure cooking? A. Yes. 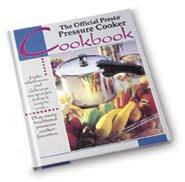 The easiest way to convert a recipe is to find a pressure cooker recipe that is similar. If that is not possible, a good rule of thumb to follow is to decrease the cooking time of your recipe by two thirds. For example, if your ordinary cooking method requires 45 minutes, the pressure cooker cooking time will be approximately 15 minutes. Remember to document your results so you can perfect your timing. Because there is very little evaporation in a pressure cooker, the amount of liquid should also be reduced. Generally, use about 1 cup more than you’ll desire in the finished dish. Remember, however, that there must always be some liquid in the pressure cooker to form the necessary steam. A. Yes. Wine, beer, bouillon, and fruit or vegetable juices all make excellent cooking liquids in a pressure cooker. You're only limited by your imagination! A. Not if you use the cooking rack properly. Flavors of foods are blended when they are cooked in the same liquid. The cooking rack allows you to separate the foods and hold them out of the cooking liquid so you can cook an entrée, side dish, and dessert all in the same pan without having the flavors intermingle. Of course, for recipes where you want the flavors to blend, simply remove the cooking rack. A. Most stainless steel and aluminum pressure cookers will work on gas, electric coil, and ceramic glass (smooth-top) ranges. However, because pressure cookers are typically not magnetic, most will not work on induction type ranges. Check your manufacturer’s instruction manual. Each time you clean or use your pressure cooker, check to be sure the bottom has not been damaged. Nicks and scratches may leave sharp edges that can damage ceramic stovetops or other smooth surfaces. Always lift your pressure cooker to remove it from the burner. Sliding any type of cookware can leave scratches on stovetops. A. Simply bring the pressure cooker back up to pressure and cook the food for a minute or two longer. A. No, however, browning adds a rich, robust flavor to a recipe. It is recommended in many instances to enhance the flavor, but it is not necessary if time is short.